"If I by a Long Call Option, what is my expected return"
The Long Call Option Profit / Loss Calculator defines Positions Cost, Break Even, Profit at Target and Profit percentage. What makes this calc great is that it includes trading comm on the”buy to open” and “sell to close” side, giving you true return accuracy. Let’s say I think ABC stock will go higher. I buy a Call option. The Ask premium (“buy to open” price) is $2.50. 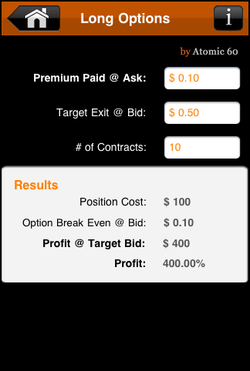 My Target Bid (“sell to close”) is $5.00 which targets a 100% profit target. I buy 10 contract. My Option Trade Comm is $6.99 with a per Contract Comm of $0.75.